“They are artistes. What do you think… Are artistes terrorists?” Salman asked at a press conference here. “They come to India with visa. Who gives them the visa? Our (Indian) government gives them visa. The government gives them work permit,” Salman added. But the veteran actor did not specifically question the moves in Bollywood to ban Pakistanis from working in films being made in India. 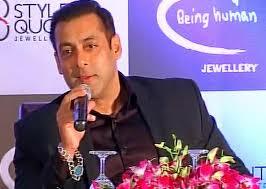 Salman was in the national capital to launch a “Being Human” jewelry line. Commenting on the surgical strikes India carried out on terrorists across the Line of Control, Salman said: “The ideal situation would have been of peace. Now when this has happened, then obviously there will be reaction to this action. He, however, justified the surgical strikes, saying it targeted the terrorists who killed 19 Indian soldiers in Jammu and Kashmir on September 18 and were planning more attacks. The Maharashtra Navnirman Sena was the first to ask Pakistani artistes to leave India. The Indian Motion Pictures Producers Association on Thursday decided to ban Pakistani artistes from working in Indian movies.